Unknown is a movie that starts off with a pretty cool initial premise. A doctor and his wife travel to Germany for a lecture in innovative technology and the doctor leaves the hotel to go back to the airport after something he left behind. During the cab ride, there is a horrible accident where the cab goes off a bridge. The doctor is saved, but in a coma for a number of days. When he awakes, he goes to find his wife and she does not know who he is at all. In his place, another man stands beside her, claiming to be the real him. 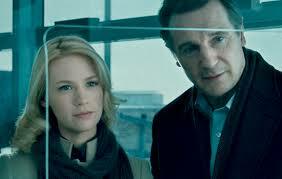 Liam Neeson is the film’s star, playing dr. martin Harris, and this actor is no stranger to foreign country thrillers. unknown is absolutely meant to cash in on the success of nelson’s big hit thriller taken from a few years back. and why not? that movie was an absolute gamble, having an older actor as the star of an action movie. and it paid off brilliantly. Neeson might not be as young as Matt Damon or Daniel Craig (the respective stars of the Bourne and bond series’), but he’s a believable tough guy actor and he’s also someone you can relate to in emergency situations like the ones these movies throw him at him. One thing really cool about this movie is that it examines every Possible reason behind what is happening and has Harris search endlessly for an answer. At one point, after looking up his name on the college website where he is a professor and seeing a photo of the other man Pop up on the monitor, he starts to really doubt himself. In that moment, he thinks that maybe the whole thing is an illusion in his head, and he has made it all up. I like that he has that moment, where he looks at the other side and says, maybe I’m wrong. It’s short lived, of course, because there are people trying to kill him around every corner and that kind of tips him off that there’s more to this than he knows. He doesn’t know why these people want him dead, but he’s guessing it has something to do with the man who has stolen his identity. Harris fights off thugs in a hospital, and then later in an apartment building. The action isn’t half as good as it was in taken, but that’s okay, because this is a different kind of movie. That was a pure action movie, whereas this one is more of a psychological thriller. Neeson finds himself in a situation where he knows no one, and is out of ideas for what to do next. Being a foreigner in a strange country, he only has so many options. And so he goes seeking the woman who saved him in the accident, the driver of the cab. She’s played by Diane Kruger (Troy), and she’s really good here as a foreigner who is willing to help him because it’s the decent thing to do. Neeson ends up staying with her, hoping to find answers. Another avenue Neeson pursues is hiring a detective. He hires an older man who has considerable espionage experience. This man makes smart arguments, uncertain if he even believes Neeson’s story himself. He looks for motive, just like a police detective would, asking Neeson why someone would want to pretend to be him. What would that give the person access to? Neeson writes out his schedule of where he was going to be on each day and what he was going to be doing. since he knows where he was going to be, he knows where the imposter, (played by Aidan Quinn), is going. he shows up at a meeting with a renowned science professor and Quinn is already there. Neeson pleads his case to the professor, mentioning things that he spoke to the man about on the phone. unfortunately Quinn knows all of the same little details. in one very clever, but also funny moment, the two of them, standing side by side, start talking at the same time and saying the same things. it’s as if they were clones or something. luckily this movie doesn’t get into any of that. it stays a thriller, and never goes anywhere near sci-fi. thank goodness for that. Frank Langella shows up somewhere in the second half of the film as Neeson’s long time friend. He’s here to help bail his friend out and do whatever he can to lend a hand. His presence in the foreign country also leads into a major twist, which is absolutely thrilling. We know there’s a reason for why all of this is being done to Neeson, but there’s a lot more to it than just the reason why. Another major question that is answered before we even know we should be asking it is the question of how. How are these people able to do all this? There’s some pretty good casting in this movie, first and foremost of course being Neeson in a genre that he has had success with in the past. Then there’s January Jones as his wife, an actress so beautiful that she elevates everything she’s in. it’s nice to have Aidan Quinn back on the screen, and Frank Langela and Diane Kruger are both seasoned veterans at this Point. Every one of these players helps carry the movie and make it the thrill ride that it is. The movie is helped out tremendously by its end revelation and twist. A good movie needs a great twist at the end and this one has it. The twist really does explain things in ways we never could have thought of, and that’s pretty cool. The events that have happened thus far in the movie suddenly take on a whole new meaning. The movie is exciting and mysterious and it only gets better as it goes on.